If you're tall, you've probably experienced frustration from using a standard sized yoga mat. Yoga Direct has created this Extra Long, Extra Wide Yoga Mat just for you! 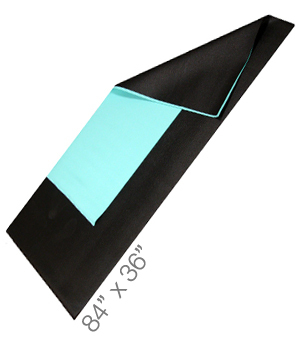 This yoga mat is a full 84" inches long...a whole foot longer and a foot wider than most mat! This mat measures in at 84" L x 36" W x 1/4" H. To compare, a standard size yoga mat is 68" L x 24" W x 1/8" H. This is a great yoga mat if you simply prefer a little extra personal space in the yoga studio. Larger yoga mats also provide added hygienic protection against dirty surfaces in public spaces. Our extra large yoga mats arrive individually wrapped and are available in custom printing. Our 1/4" thick Extra Wide/Extra Long Yoga Mats are great to have available at your studio or gym to accommodate different sized Yogis, as well as for use in Partner or Acro Yoga classes. Made of durable foam with a high-tack surface for stickiness, this mat is longer and wider than most mats to cover more area under the feet and is contructed of the highest quality materials available. This Extra Long Extra Wide sticky yoga mat is machine washable and as with all of our Yoga Mats, these mats can be easily stored, cleaned, and rolled up after class. Each Extra Long Extra Wide Yoga Mat arrives individually wrapped, and can also be custom printed or branded with your own company or studio logo or design. Perfect for my husband who is 6'-4". I was very pleased with this mat. It is just as described and very comfortable. There is no need of paying tons of money on more expensive mats. I will definitely recommend this site to my friends. The size and quality of this mat is outstanding. I love it and it is easy on my joints when kneeling or other floor activities. Would highly recommend it to anyone. Very satisfied with the quality and price, just what I needed. I am 6'4" and most mats are way too small. As I searched for over-sized mats, I was astounded by the prices. This is a high-quality mat and I sit next to people on mats costing $100+ and there is truly no noticeable difference. Great Mat for home practice! I'm 6'3, 240 lbs and I like using this mat at home for my yoga and foam roller restorative practices. It's a little ungainly to tote around to classes though. Excellent mat in this price range. I'm a big guy and have just started yoga. As much as I loved it there was the problem of these little mats mostly made for women. This mat changes all that. Plenty big and is very functional for my needs. My guys love these. We use them in our shop so that the guys don't have to lay on the ground while they are working on vehicles.